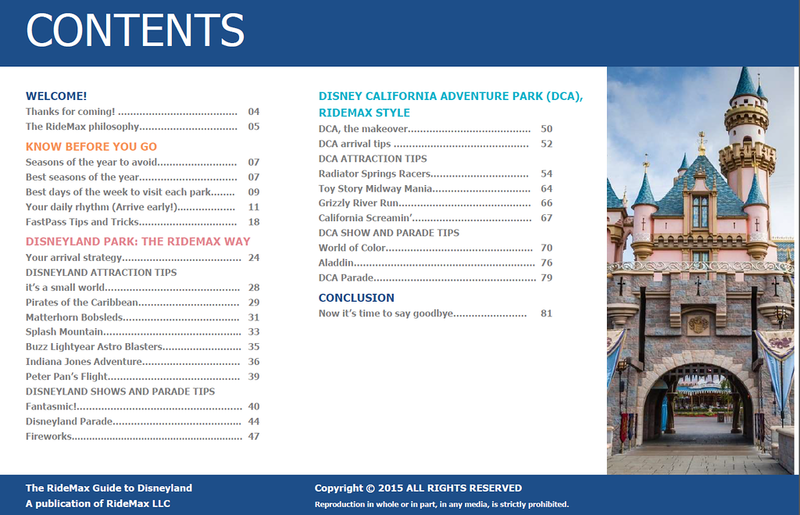 I’m excited to announce the completion of a new eBook that I’ve been working on for a while now, called The RideMax Book of Tips for Disneyland. It officially began shipping last month as an optional add-on to Disneyland RideMax subscriptions. One thing I really like about this book is that it gave me the opportunity to share some tips with larger, more detailed photographs than the regular “Tips & Hints” pages inside RideMax were really designed for. It’s currently at 81 pages of full-screen goodness, though this may increase in the future as new pages are added. Now, you may also be wondering if the eBook replaces the “Tips & Hints” we’ve always published in the RideMax planning tool itself, and the short answer is no, it does not. You’ll still find the great information inside “Tips & Hints” that you’ve come to rely on. The eBook does contain new pictures and some information not found in the “Tips & Hints” pages, but the eBook is not required to enjoy using RideMax in the way you always have. And of course, to make the eBook as risk-free a purchase as possible, it’s covered by our normal 30-day money-back guarantee, just like the RideMax subscription itself is. I hope you enjoy the new eBook, and that it helps you make your visit to Disneyland even better! Christy, could you try this again this morning? It seems to be working for me, so maybe this was just a temporary issue. If you’re still seeing the problem, what web browser are you using, and are you seeing any specific error message, etc? Are you working on a similar version for DisneyWorld? This is a good possibility in the future, Pamela, but nothing under way currently. I bought a subscription in Feb 2015, how can I add the ebook? I know this has nothing to do with the ebook, but I heard Radiator Springs Racers is now connected to the rest of California Adventure’s FP system. Is that true? Yes, Matt, this is correct.